Speaking at a “graduation parade” for military skills development volunteers. 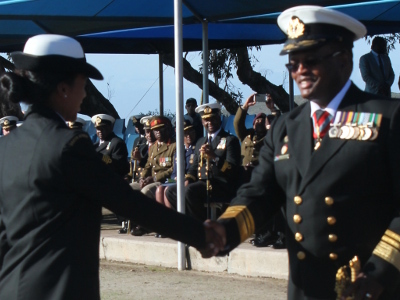 SA Navy Chief Vice Admiral Mosiwa Hlongwane pointed out the six months spent in uniform to date contributed significantly to them becoming “well-rounded, smart young adults”. A hundred and eleven volunteers who made it to the acceptance stage of the 2017 Military Skills Development (MSD) programme earlier this week marked the successful completion of the basic military training (BMT) phase of their two year service at SAS Saldanha, the premier training facility of the maritime arm of the SA National Defence Force (SANDF). Hlongwane told the group that “within the context of structural unemployment in South Africa, you had a one in nearly 15 000 chance of being selected for the programme”. According to him structural unemployment essentially occurs when there is a mismatch between skills levels of the unemployed and jobs available. He added that the SANDF MSD programme contributed to creating an enabling environment to empower young South Africans. As far as the mental and physical challenges the volunteers had to face during BMT, the Navy Chief pointed out it was “a struggle” for some parents to recognise their sons and daughters on parade. One, he had been reliably informed, CNavy said, now wore pants of “substantially smaller size” than when he arrived at the West Coast naval training facility. Among the disciplines and skills learnt during BMT, Hlongwane singled out swimming as one with particular reference to his arm of service. “Swimming was, and always is, one of the key physical challenges your sons and daughters have to overcome as many are unable to swim when they first arrive here. But, after the proverbial blood, sweat and tears, coupled to unparalleled tenacity, they surprised even themselves. “Today 111 young men and women have met the challenges head on and can be justifiably proud of their achievements,” he said before telling their assembled families they were “smart, professional, disciplined sailors ready for further functional training” before going into service aboard the Navy’s ships and submarines. In closing Hlongwane echoed what SANDF Chief General Solly Shoke has always maintained – discipline in the South African armed forces is not negotiable. “The SA Navy is generally forgiving of honest mistakes, mistakes from which members learn and which are not repeated. But, men and women on parade, the SA Navy, indeed I, the Chief of the SA Navy, will not tolerate indiscipline or delinquent behaviour. I expect you to be disciplined sailors and to uphold the code of conduct at all times. This is an organisation I am proud of and I expect you to serve with the same patriotism, zeal and pride that I do,” he told the parade.